When it comes to decorating and books, most of us need little introduction. It is arguably the most common method of decorating open shelves and cabinets across the globe, and is often the easiest way to quickly introduce some life into a sterile setting. Decorating with books is fun, and obviously at the heart of it all is a great wealth of knowledge that you can flip through whenever you are bored with the electronic noise around you. It is amazing how in the world of iPad and Kindle, the good old book still holds as much sway as it did a couple of decades ago when it comes to interior decorating! 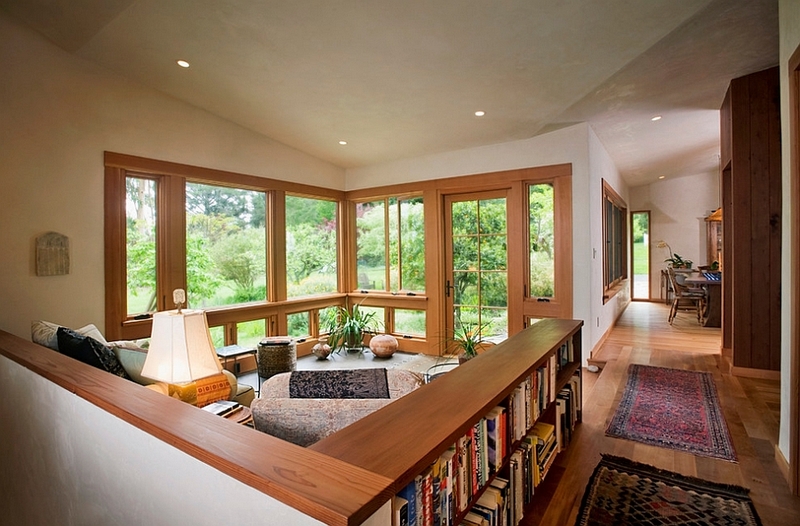 There are those among us who love our books dearly and proudly showcase our favorite page-turners in the living room. Others though might just want to fill up that empty space with a few colorful magazines and books without actually ever worrying about the content inside! 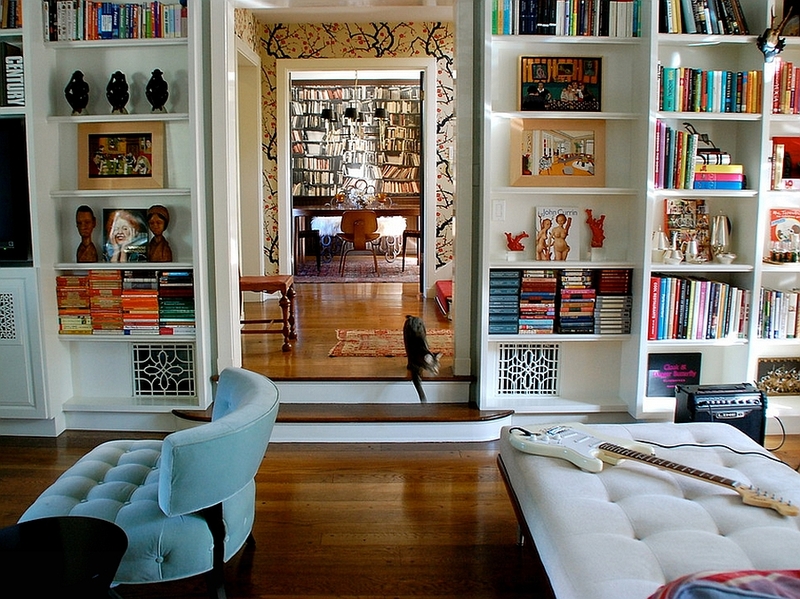 No matter which section of the crowd you fall into, here are a few smart ways to decorate with books in style! Have an extensive book collection that you love ever so dearly? 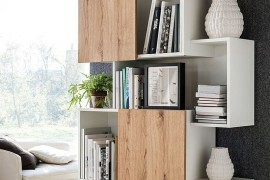 Then why not make it the focal point of the living room by adding a stunning wall unit composition that puts the books under the spotlight? 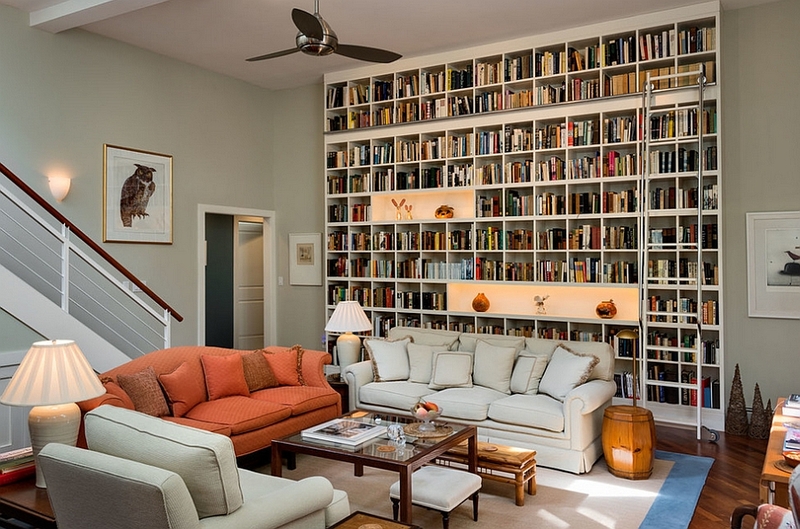 Floor-to-ceiling bookshelves are quickly catching on as a living room accent wall addition across the globe, and unlike the mundane accent wall with bright color or varied texture, a giant bookshelf looks truly sensational. Giving your interior a warm, cozy appeal, you can use one of those library-style ladders on wheels to complement the beautiful ‘wall of books’! 2. Give It a Tilt! 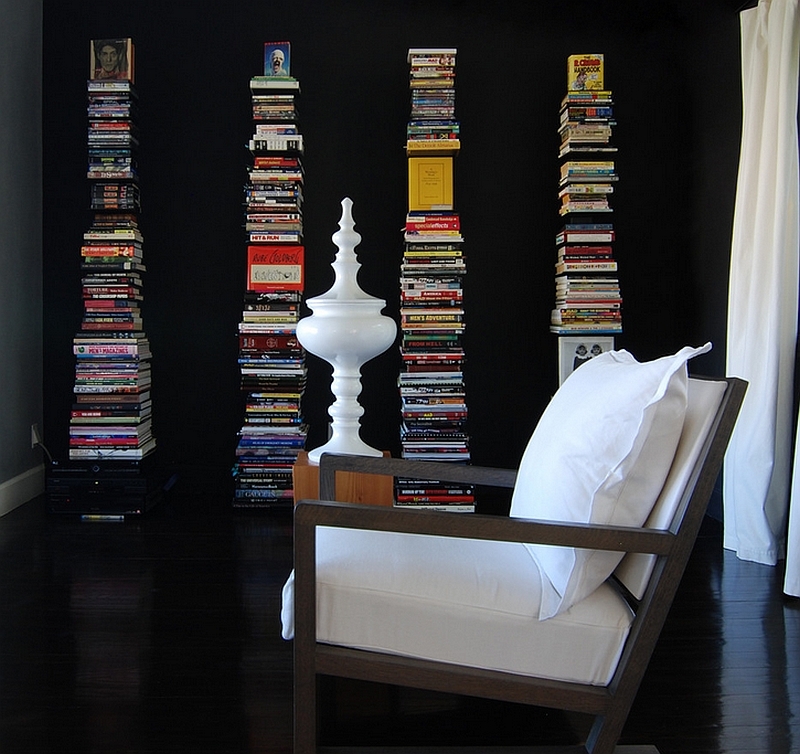 For those with a far less extensive collection, decorating with books is all about giving the room a hint of visual and geometric contrast. 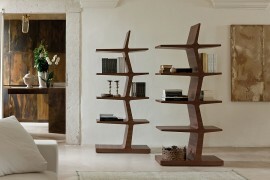 Tilted shelves accomplish this task with ease, and they also let you arrange your favorite titles in a trendier, more casual fashion. 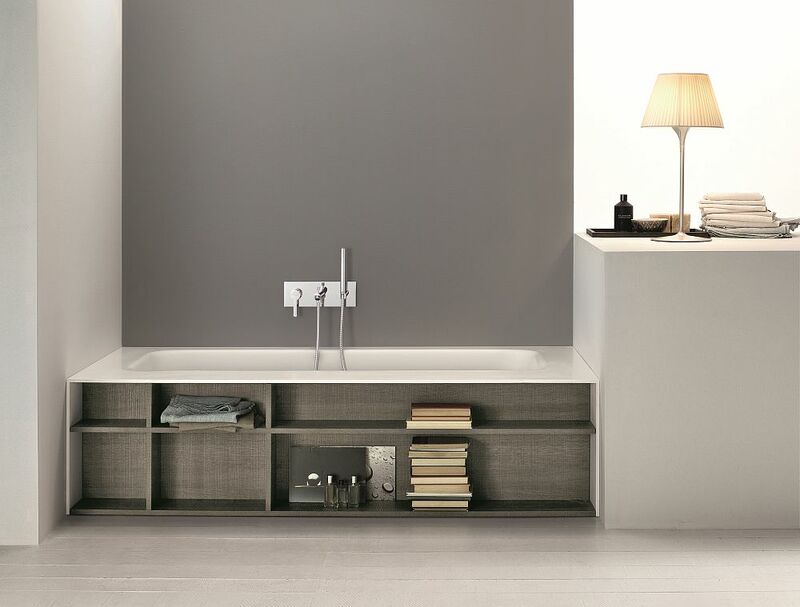 Contemporary bookshelves come in wide variety of shapes and sizes, and you can even custom-create hexagonal bookshelves, zigzag floating shelves or other cool compositions to decorate with books in an ingenious manner. Place these shelves around the entertainment center in the living room or in the corner of the bedroom to create dazzling displays. Just casually placing books on the coffee table, the kitchen counter or even the bathroom vanity might seem like lazy decorating, but it is all about getting the placement and angles right! 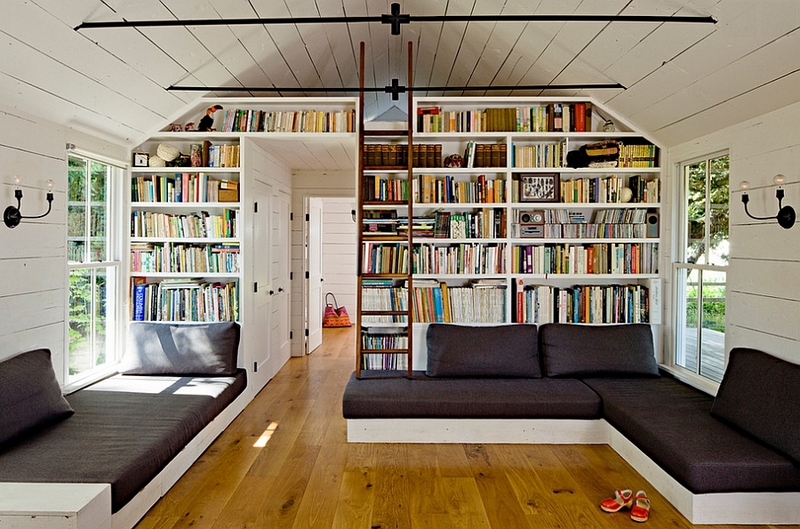 You simply cannot just throw a couple of books anywhere and hope that they add to the aura of the room. 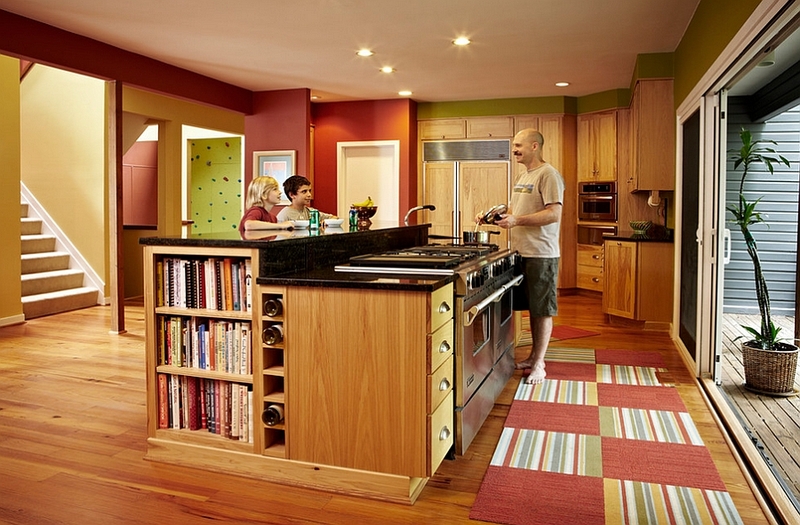 Pick books with colors and themes that complement the rest of the room and add to its appeal. Sometimes a couple of books with dazzling and colorful covers are all the color you in need in a minimal or Scandinavian-style living room clad in white. 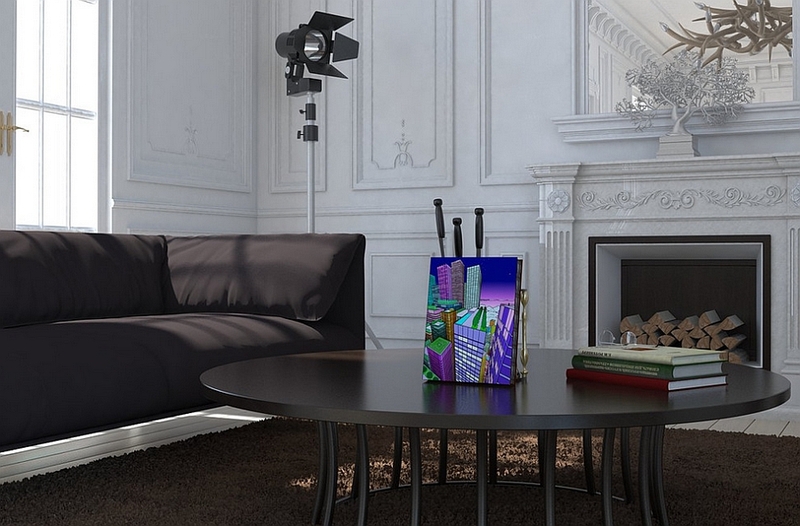 No matter what you choose, make sure that these additions stand out visually. 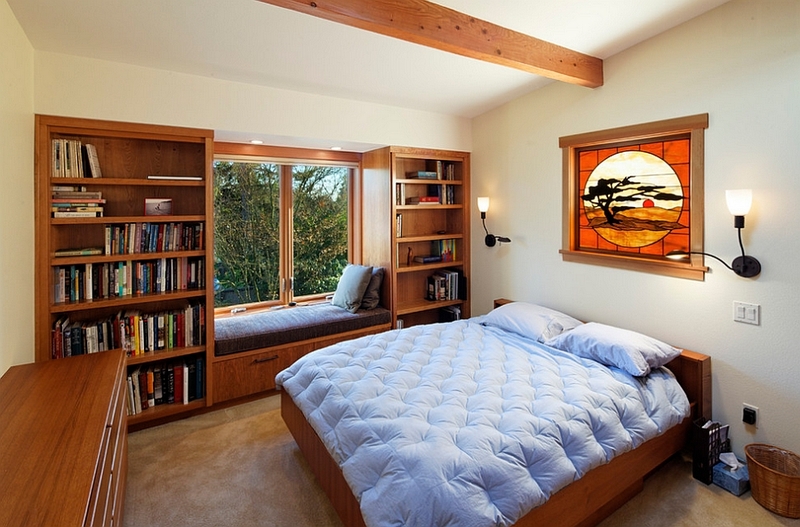 Often we see homeowners hesitating to take books beyond the living room and the bedroom. In fact, decorating with books in the kitchen, the dining area and the bathroom creates a far more spectacular and dramatic effect than using them in the living room. 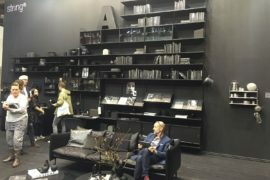 Since one would not normally expect books to become a part of the decor in these rooms, they tend to bring a lot more excitement, even when used sporadically. A kitchen island with a stylish shelf that holds cookbooks is a sensible addition, while a hot tub that lets you sink into a luxurious dip while flipping over the latest magazine looks ever more posh! 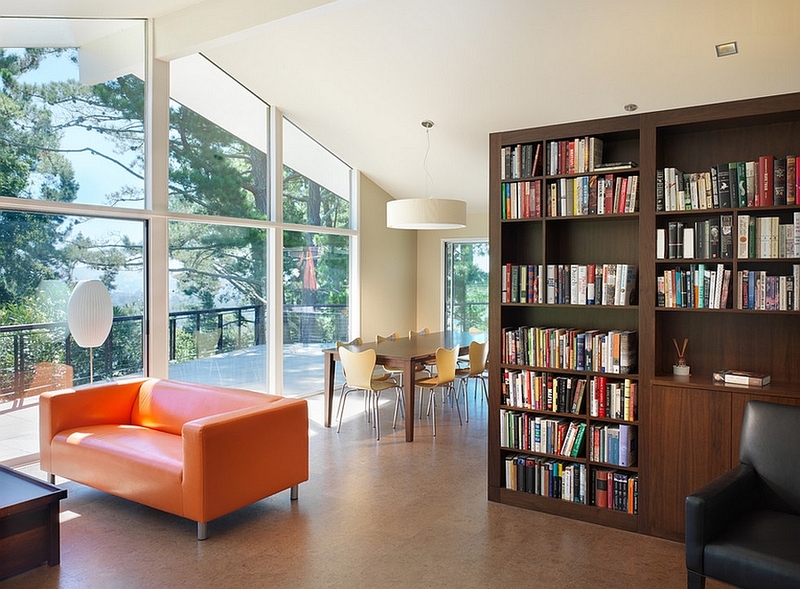 Another cool way to decorate with books is to use them in creating a distinct line between the various spaces of an open-plan living area. You can use a small bookshelf to get this accomplished or even stack the books up to create a small wall comprised of just books! This hip and casual approach looks gorgeous even in contemporary living areas, and you obviously give your guests something to talk about as well. 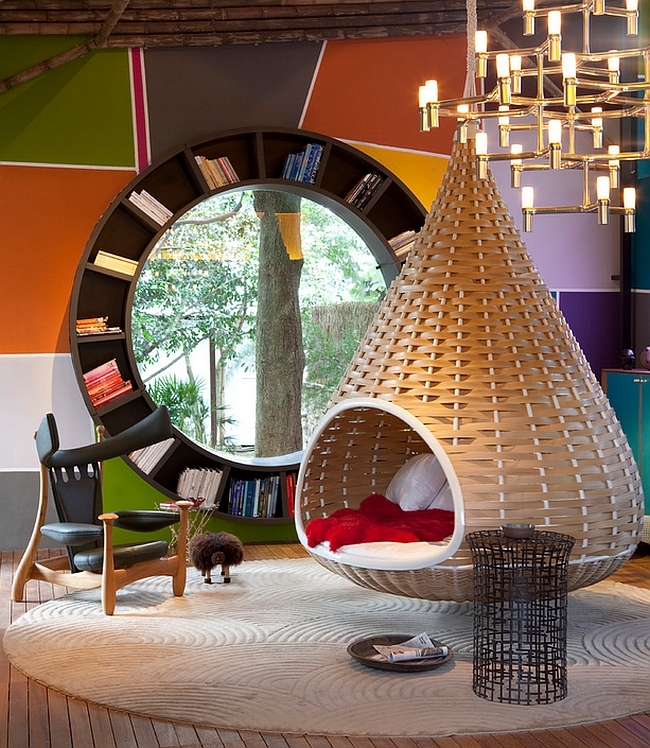 Color-coordinated book displays obviously lend a touch of brightness and sophistication to the room. In fact, most homeowners are now headed in this direction to give a brighter look to their display while subtly playing on the popular ombre effect. You can choose a color that suits the style of your home best and pick books in varying shades and hues to achieve this look. If you are not happy with it, you can try a ‘rainbow style’ that sees each color transitioning into the next with effortless charm. 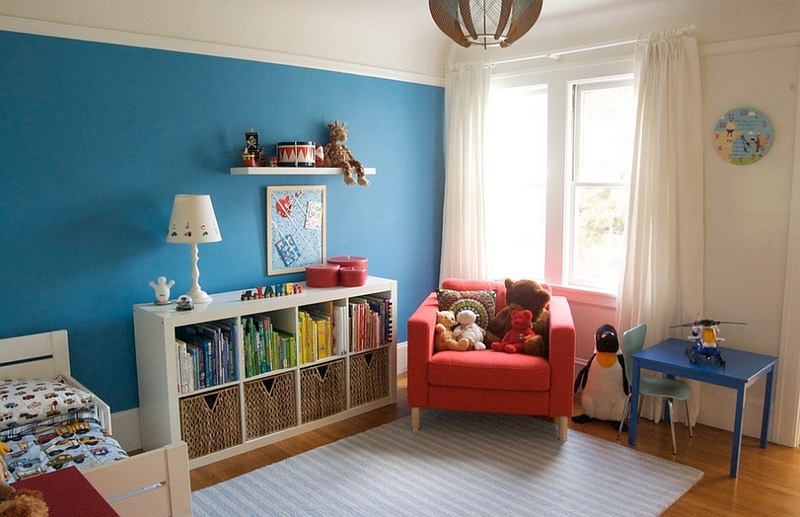 This decorating technique looks particularly cool in kids’ rooms, as it adds color to the space in an elegant and organized manner. 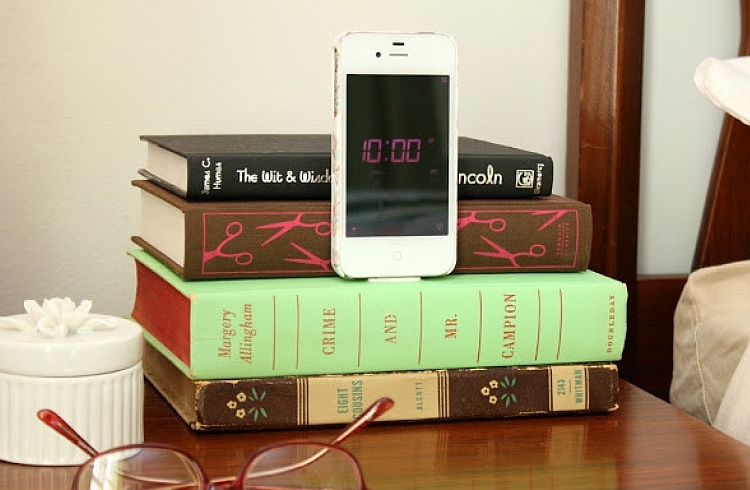 There are plenty of ways in which you can upcycle those old books with a hint of creativity and inspiration. This is probably the most exciting and personal way in which you can decorate with books while staying busy for a weekend or two with a fun DIY project. 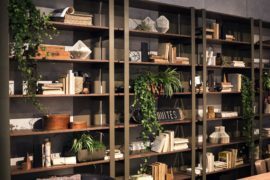 From beautiful bookshelves that are crafted from books themselves to gorgeous iPhone charging stations and lovely book planters, the options here are only defined by your imagination. 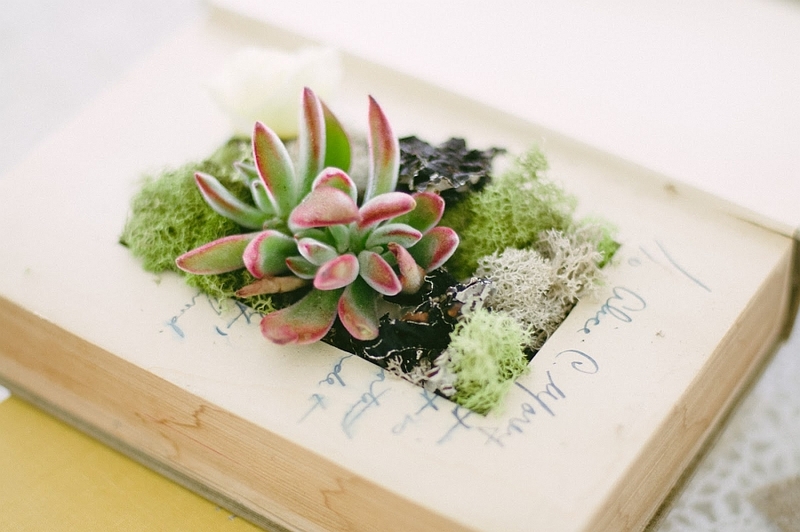 Here are a few fabulous DIY upcycled books ideas to get you started on the right path. 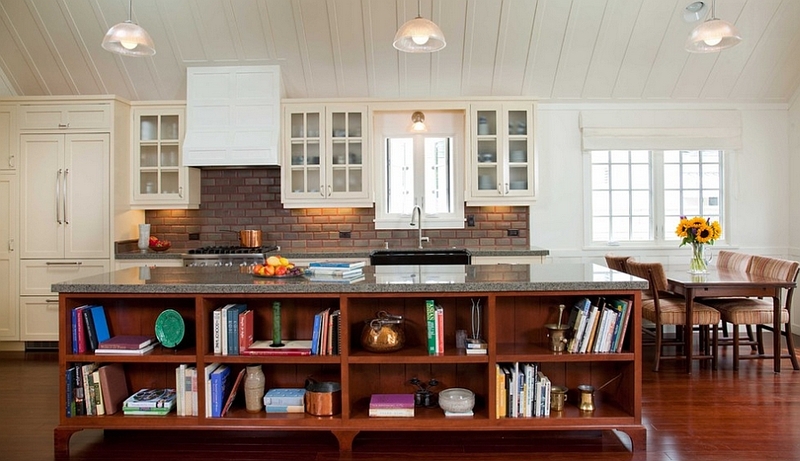 Decorating with books is as much fun as playing around with decor, colors and accessories. In fact, it is a lot easier and far more ergonomic. 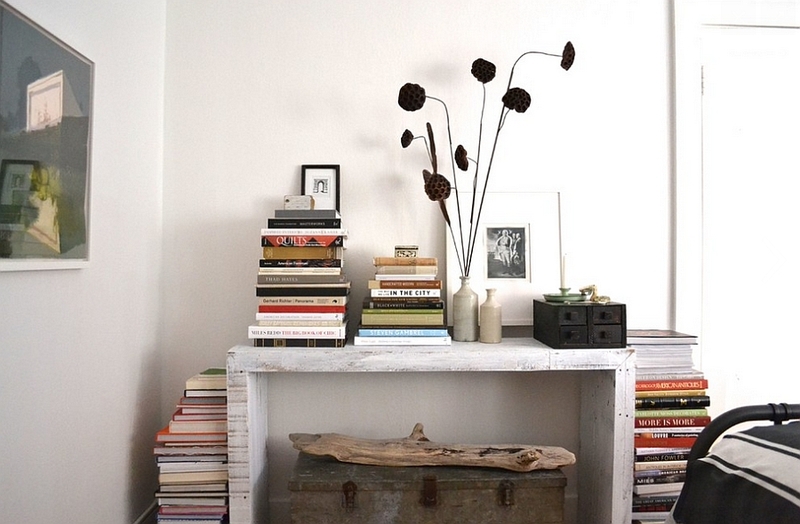 So, why not pull some of the books out of the cardboard box in the attic and give them a new lease of life? You will be pleasantly surprised with the results!